A man who has spent more than 40 years collecting 9,300 beer cans has had to get rid of the bulk of them so he can buy a smaller house. Nick West, from Langford in North Somerset, has moved into increasingly larger homes to keep pace with his growing collection. But he now wants to downsize, meaning a reduction in his collection to 1,500. 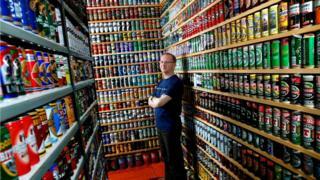 At one point, Mr West was buying 650 cans a year and he admitted stopping would be "very painful". Mr West started his collection in 1975 when he was 16 years old, after seeing a report on TV about a man who sold beer cans to collectors in the US. "I wasn't old enough to buy them myself but luckily my parents humoured me and would buy me a can or two, if they remembered, in their weekly shop," said Mr West. He met his wife Deborah a year later while still at school, and she bought him a book about beer can collecting. "So she knew what she was letting herself in for," he said. His first can was a half pint of Heineken - and the oldest can in the collection dates from 1936. Some of the cans still have beer in them but some have been emptied by making a small hole in the bottom. Mr West estimated he has spent at least £25,000 on his collection over 42 years. He spent two years taking photographs of each individual can, and had to see a doctor after developing tennis elbow and housemaid's knee as a result. "Stopping collecting was a very painful thing to do. It's been such a massive part of my life," he said. "But with the introduction of new craft beer cans, I was buying 650 cans a year just to keep up, and I no longer had the money or space for them." During his last house move Mr West had to to pack his collection into 150 large removal boxes and hire two vans - one for his furniture and one for his beer cans. In one of his previous homes he even built an extension to make more room. Now, in readiness for the next move, he has sold about 6,000 cans to collectors around the world and given 1,800 to local museum Oakham Treasures. It donated money to the charity Action for ME on behalf of Mr West, whose daughter was diagnosed with the condition when she was 10 years old.